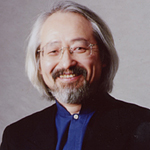 Japanese conductor Masaaki Suzuki (b. 1954). While working as a solo harpsichordist and organist, in 1990 Japanese conductor Masaaki Suzuki founded the Bach Collegium Japan, with which he embarked on a series of performances of J.S. Bach's church cantatas. He has recorded extensively, releasing highly acclaimed discs of vocal and instrumental works on BIS, including the ongoing series of Bach's complete church cantatas. As a keyboard player, Masaaki Suzuki is also recording Bach's complete works for harpsichord. BBC Music Magazine: Choice of the Month.